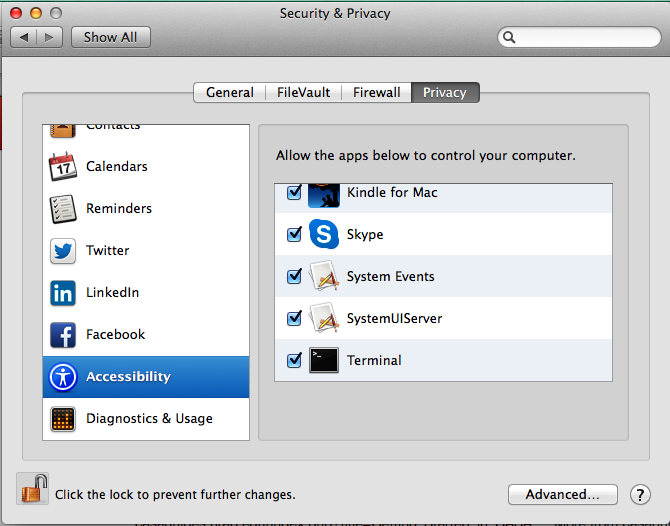 Accessibility settings for non-GUI apps using AppleScript in OSX Mavericks? In previous versions of OS X, to allow AppleScript to be run you needed to check “Enable access for assistive devices” in the Accessibility pane of System Preferences. I also tried adding all applications to the permissions dialog and still receive the permissions denied error. If I understand correctly, you want to enable GUI scripting from a command line. I believe you will need to use the following code to enable GUI Scripting from within an applescript. That script can then be executed from the command line. You may want to exclude the display dialog as needed -- this script just presents the dialog to confirm that the GUI settings have been made active. display dialog "GUI Scripting is enabled"
display dialog "GUI Scripting is disabled"
I worked round this by starting the jenkins slave by using JNLP rather than SSH. You can set this up in the slave node settings on the jenkins master. To set this up i created an automator script which runs at login so the jenkins slave runs as a real user. This causes osx to popup an enable application access to assistive devices popup for the automator script which then allows it to access everything. Another solution is to run the command by spawning a terminal which i guess is not in apple's banned list of things for assitive access. Not the answer you're looking for? Browse other questions tagged macos jenkins applescript or ask your own question. How to grant Applescript permissions through Applescript?